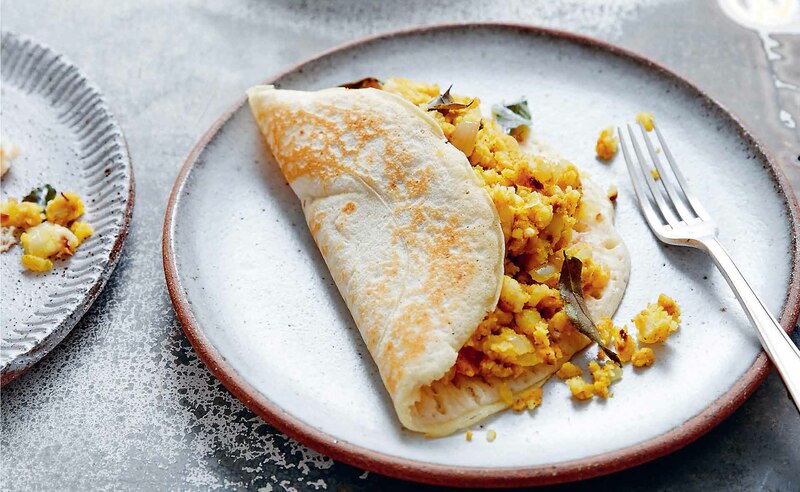 The classic Sri Lankan spiced, potato-stuffed masala dosa gets a contemporary twist by Lentil As Anything's head chef. To make the filling 1. Boil the potatoes in a saucepan of water until soft, then drain and mash. 2. In a frying pan, sauté the onion and garlic in the olive oil. Add the curry leaves and remaining spices, allowing them to cook for a few minutes. Add the mashed potato and mix, then take off the heat. Season with salt and pepper to taste. For the dosa batter 1. Mix all the ingredients in a bowl until a smooth, runny consistency, just a bit thinner than pancake batter, is achieved, adding more soy milk if needed. To cook the dosa 1. Heat 1–2 tablespoons of oil in a frying pan. Pour in a quarter of the batter and cook each side until golden brown. Cover half the pancake with a quarter of the potato mix, then fold to enclose. Remove the pancake from the frying pan, and repeat with remaining batter and filling. 2. Heat 1–2 tablespoons of oil in a frying pan. Sauté the mushrooms, tomatoes and spinach, and serve alongside the dosa. Enjoy! This recipe is an extract from Cooking With Kindness ­– Over 70 recipes from Australia’s best vegan chefs and restaurants by Edgar’s Mission, RRP $35. All royalties go to Edgar’s Mission to enable them to continue their important work. Dipesh Mainali is head chef at Lentil As Anything, Abbotsford.